Mulranny station opened in August 1894. At the Mulranny stop the Midland Great Western Railway built a hotel to cater for visitors to the area. The luxurious Great Western Hotel opened at Mulranny in 1897 and a combined rail and hotel ticket was available. This is one of the first examples in Ireland of the bundled ticket. The hotel was equipped with every modern convenience of the time, including electric light, and by 1900 hot and cold water baths were also available. Realising that the tourists needed access to the beach area a pier was built , funded by the Railway company to enable people to access the beach area. 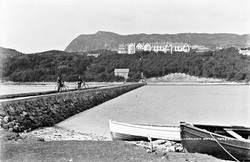 This can be seen in the picture opposite.Patrons had access to sandy beaches and the use of the hotel's boats and golf links. Mulranny , an area of exquisite natural beauty , was originally planned to be the terminus of the Westport line as it always proved to be a popular tourist destination.